lovely couple expecting their first baby next month…. 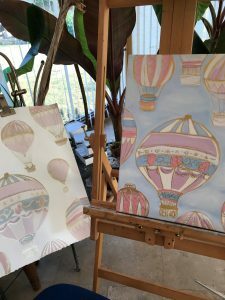 The Air Balloon Design is from the Nursery wallpaper. 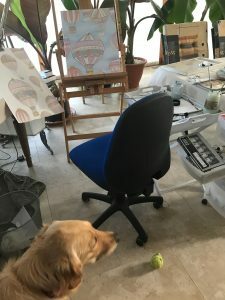 I am adapting the design for a canvas and decorating a Pre loved Rocking Chair. My assistant Goldie is on hand to help! When the baby is born next month! I will personalize my artwork with her name and date of birth. The canvas is painted using oil paint. Pale Blue sky and soft white clouds in the background. 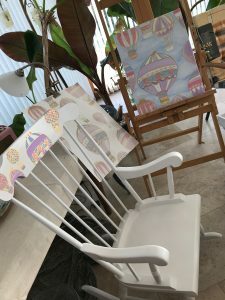 The restored Rocking Chair has been given a new lease of life. 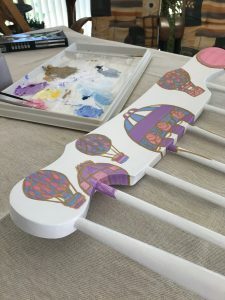 The Air Balloons are painted using Acrylic Paint. ……… to be continued… thank you for viewing.